December | 2011 | Where in the World Are Our Kids? Since most of blogdom is doing the same, I thought I would take a look back at the top three most popular posts on this blog in the last year. In fact, there are probably not three other posts on this blog that better encapsulate what we have been through this year: the worst of times, and the best of times. Even though I wrote the words, I still found it good to go back and reflect on how God has spoken to us this year. Yes, they still bring tears to my eyes. Healing from the events of the last year is still a process — a process that takes its own sweet time. At the same time, however, God’s fingerprints are written all over our story, and there’s no better place to be than exactly where God wants us. Take a minute to read back through, or if you’ve joined our journey recently, read them for the first time. I think it will be worth your time. In chronological order (with popularity). May you be blessed this New Year with the assurance that you are exactly where He wants you to be. I’ve always loved popcorn, although popcorn hasn’t always loved me. When I was diagnosed with a corn allergy in 2007, it was a very sad day for me. Fortunately, avoidance helped me overcome the allergy, and now I’m free to eat it again! We were browsing through Target shortly before Christmas, and saw all the interesting popcorn flavorings they had like white cheddar, cinnamon and sugar, kettle corn, sea salt and vinegar, and buffalo wing, all of which sounded delicious to Ken and I. 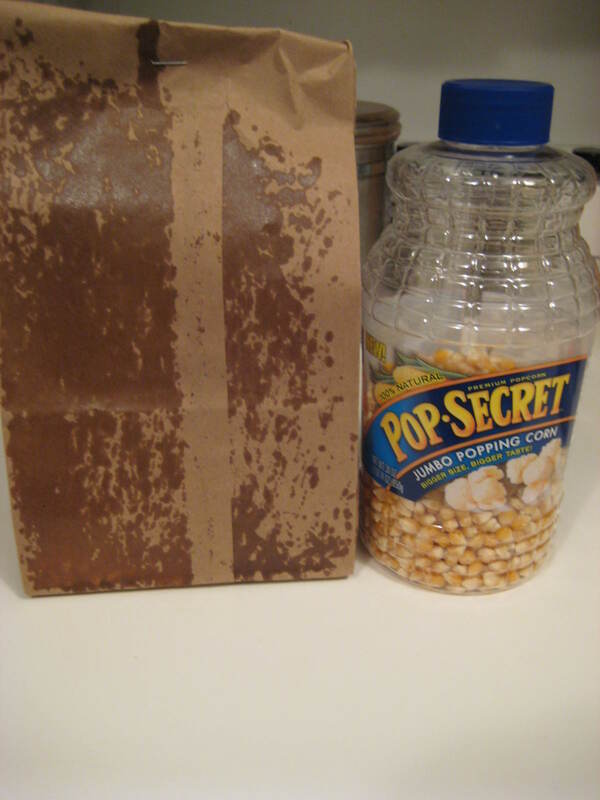 Put 1/4 cup of popcorn kernels in the brown bag. Drizzle olive oil over the top of the corn. Fold the top over twice, and staple shut. (Yes, you can put a staple in the microwave, and my microwave has not exploded.) Shake bag to distribute oil. Sprinkle with your favorite seasoning and enjoy! (Serves one generous serving.) My favorite seasoning is the white cheddar, and Ken loves the kettle corn and sea salt and vinegar — but not together. Melt together in a double boiler. 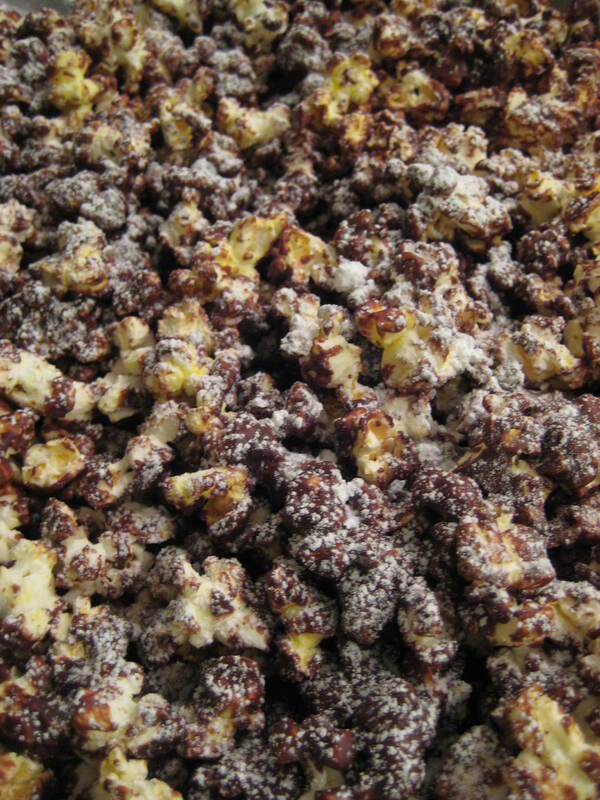 Pour over 1/2 cup popcorn, popped (double the amount in the recipe above or use a bag of microwave popcorn) and quickly stir to mix. If desired, refrigerate for 15 minutes, and sprinkle with powdered sugar. It’s delicious and addictive! Store in a tightly sealed container . . . if you have any left, that is. We received new pictures of Rose and Emmanuel yesterday. (And as with all things important, we can’t post them online.) Believe it or not, it was the first full-size picture that we had of the two of them in which we can clearly see what they look like. The photo actually captures them standing together, and they look like they could be holding hands. They both look healthy and strong. I can tell they are being fed well as their cheeks are full and their bellies are pleasantly preschool pudgy. (We pay ongoing monthly childcare fees to ensure that they are well-fed and cared-for, so at least we don’t have to worry about that.) I so wish I could jump into the picture and tickle under their chins or hug them. Anything to bring a smile to their t00-somber faces. All within minutes. Promise. I know not having updated the timeline or info pages makes it seem like I’ve neglected them. There’s nothing that I’d love more than to update them. There’s just nothing to update. I am really excited for those ahead of us in the process of adopting from the DRC through our agency. Paperwork seems to be flying and progress is being made. There are a number of families who will be travelling in the next couple of months. Hopefully we won’t be far behind them! The biggest dilemma has been what to make first! We decided to start with salsa. I like spicy foods. Ken, well, not so much. So our first salsa-making endeavor was a mild peach salsa. It was awesome! Combine peaches, tomatoes, cilantro, onion and garlic in food processor until coarsely chopped. Add remaining ingredients, and pulse until blended. Chill before serving to allow flavors to mix. Serve with pork, chicken, or tortilla chips. Ridiculously good! And good for you! The tradition of having fondue at Christmas is one we’ve held since we were dating. Ken grew up having fondue at Christmas Eve (allegedly to keep him busy so he would stay out of the presents), and we’ve kept the tradition, but now moved it to Christmas day. We’ve done all kinds of fondue: cheese, broth, hot oil, and chocolate. Some years we’ve done a day-long progression of three, similar to the Melting Pot. That usually proves to be a little much, even if spread over 12 hours. More recently, we’ve just done a cheese fondue course for Christmas dinner. Most cheese fondue recipes call for alcohol to be used, but since we don’t drink alcohol at all, I’m always scurrying to find a recipe that leaves it out. Thus, I’m posting my recipe here, where I know I can find it. You’re welcome to give it a try! Dippers, which include bite sized chunks of: apples, baby carrots, celery, broccoli, cauliflower, toasted day-old bread, grape-sized tomatoes, etc. For an electric fondue pot, the recipe can be made in the pot. For a fondue pot with a fuel burner, make it on a stovetop first, then transfer to fondue pot. Prep all ingredients before starting, since mixture has to be stirred constantly. Melt butter over medium heat, or 200 degrees in electric fondue pot. Mix 1 Tbs flour with grated cheese. Add remaining 2 Tbs flour to melted butter, and stir until smooth. Slowly add small portions of milk, stirring constantly, until all milk is added and begins to thicken slightly, taking care not to allow mixture to boil. Stir in a handful of cheese until melted. Add additional handfuls of cheese one at a time, melting the first before adding the next while continuing to stir continuously. When all cheese is melted, add nutmeg and garlic (if desired), stirring gently to mix. Dip bite-sized fruits, vegetables, and bread chunks into cheese mixture and enjoy! If you are a little more adventurous, check out this website. They have some great fondue recipes, including alcohol-free! Growing up in the United States, I never really knew what Boxing Day was, other than the day after Christmas, in which one wore off the exhaustion of overindulgence from the day before, or created more by shopping after-Christmas sales. Since I married Ken, I’ve learned a bit more about Boxing Day, and come to appreciate it as a holiday on its own. So, Ken and I celebrated Boxing Day today. We went through our closets, bookshelves, and basement and took a hefty load of donations to Goodwill this morning. It’s a great tradition that we plan on continuing with our Congolese kids too! How do you celebrate Boxing Day? If you noticed, on the Eighth Day of Christmas, we dropped off letters to Santa. Odd for adults to do? Of course! But the letters weren’t really for us. Ken and I each wrote letters to Santa, and dropped them off before sharing their contents with each other. We were informed that we could expect a response from Santa, but what we got in the mail on Christmas Eve was much different from what we expected. I was expecting a generic form letter, perhaps with the names changed at the top. Instead, Santa wrote responses to Ken and I together (even though we had written two separate letters), and a letter to each of our kids. I know it’s a long post, but it will be worth your time. It has been a long time since I have written you a letter, but Christmas is a time for child-like faith and so this year I choose to believe in you. I am not asking for the latest Xbox game, cabbage-patch doll, or shiny new bicycle. Instead, my wife and I are adopting two children from the Democratic Republic of Congo and we would like to ask you for a favor. You and your reindeer travel the world on Christmas Eve delivering toys to girls and boys. We do not know if our children have been naughty or nice, but we are certain that they are loved. Although we have never met, we already miss them more than words can express. This Christmas Eve, when you visit the orphanage in Kinshasa, could you make sure that they are tucked in and safe? And we would ask that you whisper to them a simple message, in French, while they sleep. Thank you Santa, and next year we look forward to welcoming you to our home and delivering presents to two children who will be enjoying their first Christmas in Tennessee. I know I’m a little old to be writing you a letter, or even to be telling you what I want, but before you put me on the naughty list, know this letter isn’t for me. It’s for my kids. My kids are Rose and Emmanuel. They are ages 3 and 5, and they live in an orphanage in Kinshasa in the Democratic Republic of Congo. We’re in the process of adopting them, and things have come to a standstill since October. There has been an election, and rioting, and much instability in the country. We were hoping to be travelling to get them this time of year, but we still have months of paperwork and processes to go through before we can get them. I don’t even know for sure that they know we exist, or that they are loved. So, here is my Christmas wish. Would you let Rose and Emmanuel know that they are loved, and that we are desperately trying to bring them home? Would you make sure their mosquito netting is snuggly around them, and that they have a toy or a blanket to cuddle with? Would you fill their caregivers with an extra amount of love, joy, and patience, and help their security guards to be brave and strong? Would you give them the gift of laughter on Christmas day – even though they may not even realize what day it is? Most of all, would you protect the places in their hearts that are meant to be occupied by a mom, a dad, and Jesus so that they don’t give up hope too soon? I know this is a lot to ask for, but I’d appreciate your help. Next Christmas, I hope to be helping Rose and Emmanuel to write letters of their own. I wanted to write and let you know that I received your precious letter. As I hear the heartache in your words, I write to bring you hope. I promise you that I will do all the things you have asked of me in order for your amazing children to be blessed this Christmas season. Though my magic exists through the innocent hearts of the young and old who believe in me, the words of my promise to you can only be made concrete through my willingness to get on my knees and join you in prayer. Through references in your letters, I am assuming that you are a couple of faith and that you have been praying to our heavenly Father, the one true source, who can make all your dreams come true. Therefore, I will spend the word of your despair and heartache so that a great number of complete strangers throughout the world will join you and multiply your prayers in loud, harmonious requests to the ears of our Lord. I promise you that your prayers will be answered and that in the Lord’s perfect timing, the gift of Rose and Emmanuel will be placed in your arms. As they already have their places in your hearts, know that peace will settle in theirs and that they will be overcome by your love this Christmas and for all the days to follow. One thing I know for certain, is that precious Rose and Emmanuel are two very lucky children. Though their current circumstances may not reveal that to them yet, your love and your desire to make your family complete will bring them full circle to the home they are truly meant to thrive in. It is evident that your love will encompass them so that any pain and anxiety they may have felt in their homeland will erase in time to be replaced by the life necessities you will provide to them as well as a loving and nurturing environment which will reveal their purpose in life. It is obvious that your hearts are yearning for them to be spared any difficulties and that you want nothing more than to become the parents they deserve. It will become my greatest wish that anything standing in the way of this gift to you will simply vanish, so that you can hold them in your arms as soon as possible. May the magic of Christmas and the power of God be revealed to you soon so that your heartache will be healed and your home will be filled with the love and laughter of a family made whole. Thank you Santa for your prayers, and for your letters. And Merry Christmas. On the Twelfth Day of Christmas, My True Love Gave to Me: Ringitydingitydingdongding Bells! You know, when we think of Christmas, we think of one thing. Bells! Bing-bong! Bing-bong! Bing-bong! Bing-bong! Ah, the SNL Sweeney sisters said it well, didn’t they? Today was a cool but sunny day to enjoy Belmont’s Christmas Carillon concert. In case you’ve not heard of a carillon, it is an instrument composed of at least 23 bells, and is played by a keyboard and foot pedals. They are typically enclosed in towers. There are approximately 180 in North America, so they are a fairly rare instrument. We were surprised that the outdoor concert was a popular Christmas Eve event for Nashville. (Where were all you people last night?) Though there wasn’t much to see, because the carillon is enclosed in Belmont’s bell tower, the sounds were beautiful, and a perfect accompaniment to Christmas Eve anticipation. Belmont’s tower was constructed in 1853 and has served as a water tower, a signal tower in the Civil War, before it became the first carillon tower in the state of Tennessee in 1928. Another special Christmas Eve treat was lunch from Nashville’s popular Deg Thai food truck, which happened to be the ONLY food truck out today and was just blocks from Belmont. The noodlicious lunch hit the spot before we faced the chilly weather for the concert! As I sat listening to the carillon concert, it reminded me of one of my favorite Christmas stories. It was in western Europe in the 1600s, when carillons were still rare, but bells were being accurately tuned in the foundries so that beautiful melodies could be played from the bell towers where they were to be installed. It was in a grand cathedral in what is now Belgium where a new set of bells had just been installed that a Bishop realized that while he had a grand set of bells, he had no one to play them. He especially desired to have the bells ring out on Christmas morning, celebrating the birth of Christ. So the Bishop sent word across the land that a bellringer was needed, and requested anyone with experience to come to audition. In those days, word was slow to travel, but eventually men from across the land came to try their hand at ringing the majestic bells. Unfortunately, because tuned bells were so new in those days, the auditioners lacked experience and talent. The Bishop became discouraged. Time was running short, as Christmas was just a few days away. He was about to give up hope, when a young man approached the rectory door, and gave a loud knock. The Bishop came to the door, and was surprised to see a young man with no arms standing before him, asking to audition for the position of bell ringer. Hesitant, but not wanting to discourage the young man, he allowed him the opportunity to audition. The Bishop and the armless bellringer entered the belfry, and the young man began to play — by striking the bells with his face! While shocked at first, the Bishop quickly realized that the music being played was some of the most beautiful he had ever heard. The Bishop tried to stop the man to tell him he was hired, but being distracted, the bellringer slipped and fell from the bell tower to his death. Alas, the Bishop had not only lost his newfound friend, but the only bell ringer he could find. Christmas would be doubly dark this year. The Bishop was shocked not only at the man’s resemblence, but at his willingness to play the very instrument that led to his brother’s death. Of course, the Bishop wanted the brother to audition, and so they climbed the steps to the top of the belfry. Both were winded at the top of the stairs, but the brother clearly moreso than the Bishop. Still, he wanted to play the bells. He began to grab for the ropes and play every bit as beautifully as his brother, but he was clearly becoming more and more winded as he played. Finally, in the midst of his first song, he clutched his chest, staggered, and lost consciousness, falling from the bell tower to the ground below. I hope this Christmas, you find time to laugh, to enjoy some good food, good music, and spend time with those you love. But most of all, I hope you find time to celebrate the wonderous gift of the birth of Christ! Tonight’s Christmas celebration was a free concert at the Frist Museum of Art. We’ve attended concerts at the Frist before, and have had a good time, and this one looked to be a great way to celebrate Christmas. We parked in a free spot at Cummins station, and made the short hustled hike over, but realized once we got there that we were a few minutes late. We listened for music coming from the lobby, where we had attended concerts before, and there was none. We looked around and finally succumb to the humiliation of asking. The attendant said that the concert was in the cafe. So we rushed back down to the cafe, where there were six people and no musician. We asked the waitress if we were in the right spot for the concert, and she said she thought so but it looked like the musician wasn’t going to show up. WHAT?! But this is the 11th day of Christmas and I have no back up plan! As we were speculating about traffic, illness, or just plain forgetfulness, a man carrying a speaker walked in. “We had set up in the lobby,” he muttered. Sure enough, the musician was at the Frist, but in the wrong area. She was heading toward us. A family of three seized the opportunity and bailed. So, we faced a dilemma: Do we stay for a concert with all three other people, or do we cut our losses and head out? We decided to stay. I sipped on a hot chocolate while Ken dug into a piece of chocolate cake, while they set up. Finally, 30 minutes late, the concert started. The artist introduced herself to all five of us and prepared to sing. She set up the song, and waited for the audio track to begin. After several minutes of uncomfortable silence, during which I identified all available exits, and ranked them in the least embarrassing to leave through, she gave up on the sound system and began singing a capella. Her lovely lyric soprano voice broke the uncomfortable silence. Well, the silence except for the three people in the back who continued to talk full-volume during her song. The music did attract a few more passersby, mostly museum staff, and the attendance topped out at a whopping 10 people. Still not enough for us to be able to leave with any sort of anonymity. In fact, she was sitting between 2 of the 3 exits. She made great eye contact with the audience, but since there were so few of us, we met her full gaze approximately every 8.23 seconds. She might as well have been sitting at our table belting out Christmas tunes. After the first song, her sound man was able to get her audio tracks to work, and the concert got underway. A fine selection of “Frosty the Snowman,” “Jingle Bell Rock,” and “Deck the Halls,” as well as a few other songs, before she turned to more serious music of “Silent Night,” “Away in Manger,” and “O Little Town of Bethlehem.” While her voice was lovely, the more she sang, the more she depended on her sheet music for words. Then for rhythm. By “O Little Town of Bethlehem,” I was convinced either she was having a stroke or was completely unprepared for the concert. She invited us to sing along, I suspect to drown out the fact that she had no idea what she was doing, but by this point, we were back down to six very confused people in the audience. No one was about to utter a musical peep. At the end of “Bethlehem,” she declared she was going to take a five-minute break, and then listed at least ten other songs that she planned to sing after the break. We were surprised that many Christmas songs even existed! Maybe she was going to start doubling up? Since she hadn’t gotten the lyrics right the first time, would she even remember what she had sung? Then we saw our chance –a light at the end of the tunnel that was either our freedom or an oncoming train. Fortunately, another audience member created a diversion by approaching her with a question, and we were able to duck out into the December night nearly unnoticed. So, it wasn’t the best Christmas concert ever. Okay, it may have been one of the worst. Into every 12 days of Christmas a little “bah humbug” must fall. On the other hand, we may be giggling about this one for years. Maybe it was a burst of Christmas joy after all. Today’s Christmas journey kept us closer to home. I think some of the best of Christmas decor in Nashville is in Opryland Hotel, which is less than 5 miles from our house. With a new walkway from free parking at the still-being-restored Opry Mills mall, it’s easier and cheaper than ever to visit. If you’ve never been, it’s hard to explain how fabulous this hotel is, and they spare no expense or attention to detail in decorating for Christmas. The lush landscaping indoors with glass ceilings creates hundreds of thousands of square feet of beautiful atria. More than 2 million lights, which take four months to hang, enhance the climate-controlled indoor labyrinth of walkways, and the outdoor drive-through Nativity is gorgeous. Scripture is even read aloud to remind guests of the real meaning of Christmas. The gift shops are always fun to look through, and the restaurants are amazing — although no longer within our budget. It’s hard to believe that all the beauty in Opryland Hotel was flooded by 10 feet if water 18 months ago, and was closed for 6 months for $215 million in renovations and restoration. We’re so glad Opryland came back, and can’t wait for Opry Mills to fully reopen. After all, they’re some of the best free spots to visit in Nashville!